Throughout our faith journey, we are extended several invitations. From the invitation to come to worship, to the invitation to care for a sick neighbor, to the invitation to bring food to the next church event, our life in a community of faith is full of them! Jesus invites us to bring all that we are and all that we have when we become a disciple. Our faithful financial stewardship is one way we are invited to respond to Christ’s invitation. Our generosity funds the mission and ministry of putting our faith in action, as God’s realm grows among us. Recently, letters with commitment cards were sent to all MCC’s members and friends. Special speakers will give testimony beginning October 28th through Commitment Sunday on November 25th. Please let us know if you have any questions. 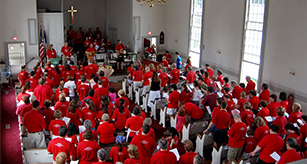 Thank you for prayerfully considering how to financially support the Monroe Congregational Church’s ministries in 2019.